The demand for sprouted grains is skyrocketing. Just last year, sales were projected to grow eight times their current levels by 2020. This healthy, natural approach to grains comes with a unique set of problems, however. Bakers and millers alike must find innovative ways to increase the production speed of the sprouting process, while ensuring sanitation. This is where the versatility of Rapidojet mixer comes in. Its jet stream, pre-hydrating technology offers economical and efficient solutions to the sprouted grain industry. Sprouting grain is pretty simple in theory. Whole grain kernels, such as wheat, are soaked for hydration and washing. Humid air is then introduced to germinate the grain, cracking the hard exterior shell. The grain is then dried to halt germination process. The result is a slightly more digestible grain compared to traditionally milled grains, with increased levels of nutrients such as fiber and vitamins. 1. One problem is naturally occurring contaminants. The sprouting process creates perfect conditions for mold and vermitoxins to grow if the grains are not properly monitored. In most standard methods today, vermitoxins are diluted, but not completely washed away. 2. Another issue is finding the most efficient way to fully hydrate the kernel while keeping the grain intact and quickly reaching the ideal germination stage. The Solution? The Rapidojet Mixer! Wait, a mixer can be used to help sprout grains? This one not only can, but it improves the process as well! 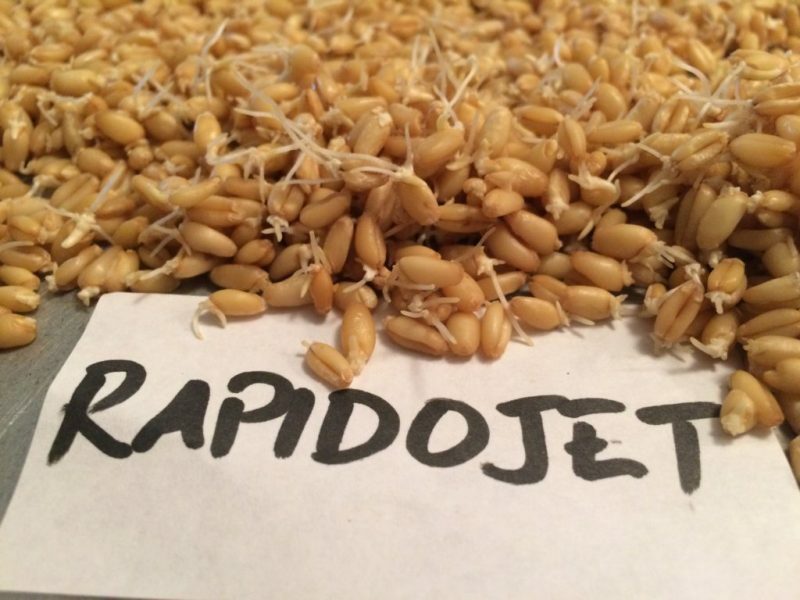 Watch the video to see how Rapidojet creates greater volume for sprouted grains. In Rapidojet, grains are shot with a high pressure stream of water, instantly hydrating them. With sprouted grains, this can help the contamination issue. Research with Rapidojet has shown that the high pressure water stream washes away contaminates from the grain’s surface, effectively reducing microbial counts. Tests also revealed this could be done with a relatively small amount of water–15 kg of water to 15 kg of wheat kernels. The effect is evident in the leftover, murky water from the rinse. And what about helping with sprouting speed? In a series of tests, some grains were pre-hydrated with Rapidojet, while others weren’t. Both sets were then left to soak in water for 48 hours. The result? The grains that had been pre-hydrated with Rapidojet had a larger bulk of volume compared to the ones that hadn’t. The conventional method had an initial hydration level of 19.78%, while the Rapidojet method was as high as 33.34%. In the end, the moisture level of both groups was the same, but the Rapidojet method reached the level much faster. Rapidojet sprouted grains shows a bigger increase in volume compared to a control soak. This is just one example of the increasing versatility of Rapidojet and how it’s raising the bar for baking standards. Discover other innovative uses for this mixer on the Rapidojet page and contact us to test this equipment at your facility.